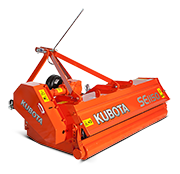 Kubota grass and straw choppers cope with whatever is required; every model is built for a variety of different tasks. Solid construction with a robust gearbox and very strong power transmission to the ‘V’ belts driving the rotor. The chassis is strengthened with double plating in the areas subjected to highest stress. The combination with Kubota’s precisely manufactured rotor shafts and hard wearing blades makes them extremely reliable. Minimal maintenance is required.